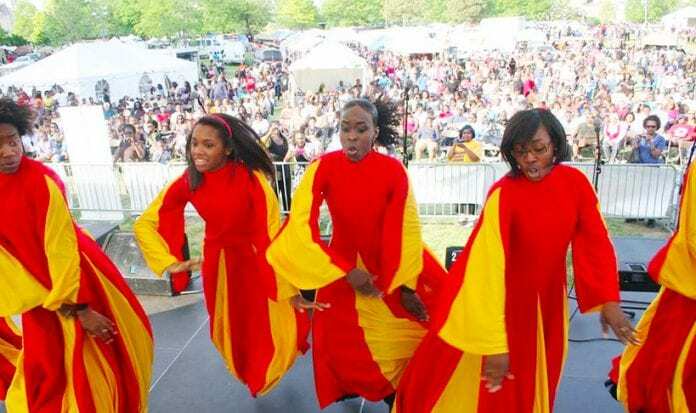 About 40,000 will be in attendance at the 31st annual Africa in April Cultural Awareness Festival in Memphis, April 21-23. MEMPHIS, TN — Roughly 40,000 people are expected to attend the 31st annual Africa in April Cultural Awareness Festival in Memphis. Vendor set up is on Thurs., April 20. The festival was started by David and Yvonne Acey in 1986. David attended black studies conferences in the 1970s and 80s and the couple realized there was a void in the city of festivals honoring African-American culture, inspiring them to create Africa in April. The festival takes place April 21-23. Each year it brings dignitaries and ambassadors from other countries to Memphis, with many of the city’s council members participating. This year’s festival, which David calls “totally international,” honors the African country of Togo. Vendors from across America and around the world bring clothes, jewelry, artwork and more to the international market. The arts are an important part of the event as well, with African drummers, stilt walkers and musicians from all genres participating. Wed., April 19, is the International Entrepreneur’s Day at the Holiday Inn that honors an executive who “exemplifies the mission, goals and statements of our organization and has an extensive record of community service, commitment, dedication and compassion,” Yvonne said. State Reps. G.A. Hardaway, Barbara Cooper and Larry Miller (D-Memphis) have participated in the past. The Children & Seniors Day on Fri., April 21 kicks off with a diversity parade featuring African dancers, music and stilt walkers, drawing students from a variety of schools. The festival also includes a Health Wellness & Community Day that offers HIV and cholesterol testing, eye care and more. Festivities end on Sun., April 23 with an International Music Day that includes a church service at Robert R. Church Park, followed by an all-day music festival of jazz, blues and reggae. Many of the festival participants dress in traditional African garb and the African marketplace showcases carvings, paintings, motifs and more that exhibit the culture. With about 60 food vendors and around 175 craft artisans, all aspects of the African culture are covered.